The USDA has declared this week as National Farmer's Market Week! There are lots of wonderful resources online for finding a farmer's market near you. For those of us in Connecticut, I've compiled a list on the Connecticut Our Locale page. And, of course, a great reference for the entire US is Local Harvest. A neat factoid from the USDA: Since the United States Department of Agriculture (USDA) began declaring National Farmers Market Week in 2000, the number of farmers markets in the nation has almost doubled, from 2,863 markets in 2000 to more than 5,000 last year. Over at Farmers Market Coalition they're asking members to share ideas for celebrating and communicating the benefits of farmers markets in their communities during National Farmer's Market Week. Any special events going on in your area? Are you doing something special? Please feel free to share in the comments section of this post. 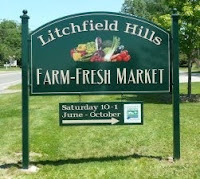 Of course for us locavores we don't need a special week to celebrate local farmers and local food. It's always farmer's market week for us. Nonetheless, it's an extra good excuse to visit your local farmer's market or take a drive to visit a new one. It's a good excuse to drag a few friends along too! Thanks for the heads up :-) Nothing special planned yet, but your post has me hunting for something fun. Luckily, CT is a small state so nearly anything is an option!